Contents and Media: 265 parts in grey plastic; two parts in smoke-tinted clear plastic; 22 parts in clear plastic; eight polythene caps and five metal pins; decals for three marking options. Advantages: State-of-the-art quality in terms of moudling, surface features and detail; accurate; new parts supplied for this version (i.e. 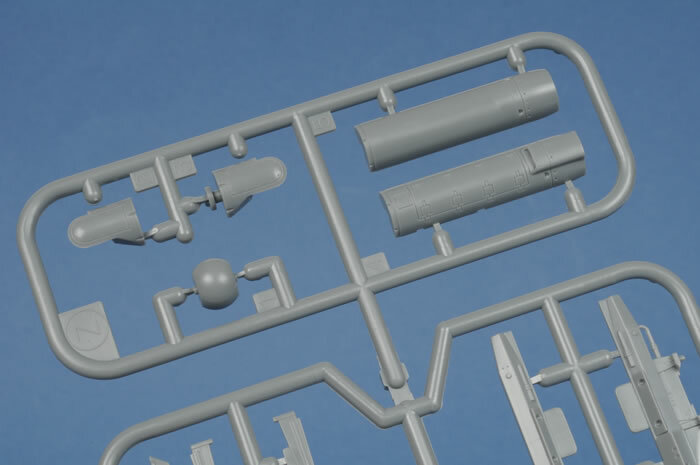 small intake and F100 exhaust, early main wheels, unbulged gear doors); many new ordnance and configuration options; clever engineering will make for an easy and precise build; alternate tinted and clear canopies; three interesting marking options. 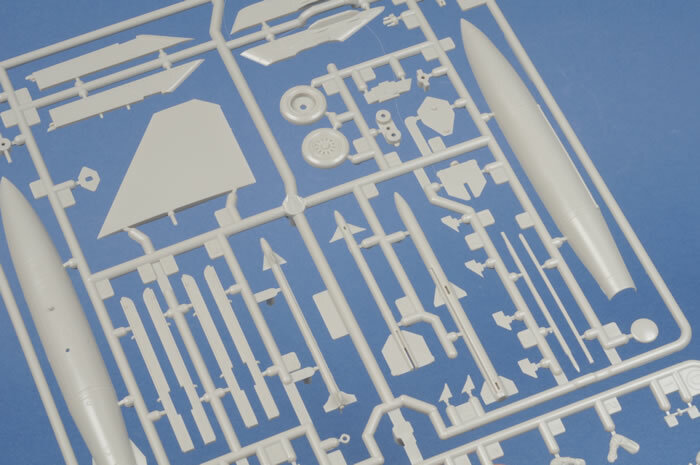 In early 2007, Tamiya's F-16CJ Block 50 kit set new standards in detail, engineering and precision fit for 1/48 scale modern aircraft models. The parts breakdown suggested that different versions were in the wings. The first of these different versions is now available - the F-16C Block 25/32. 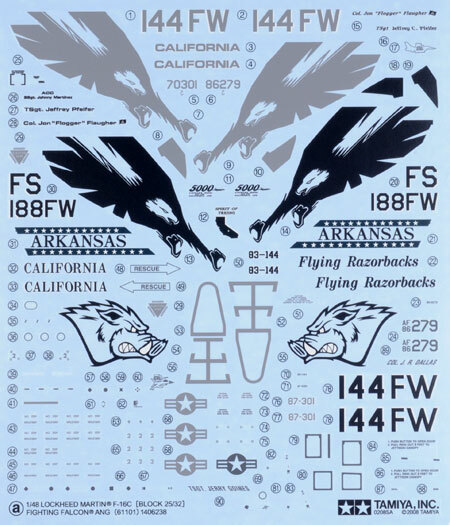 Tamiya's 1/48 scale Lockheed Martin F-16C Block 25/32 comprises 265 parts in grey plastic, two parts in smoke-tinted clear plastic, 22 parts in clear plastic; eight polythene caps, five metal pins and three interersting marking options across three compact decal sheets. This release differs from the Block 50 in that it has all the parts required to build a Pratt & Whitney powered F-16C Block 25 or Block 32. 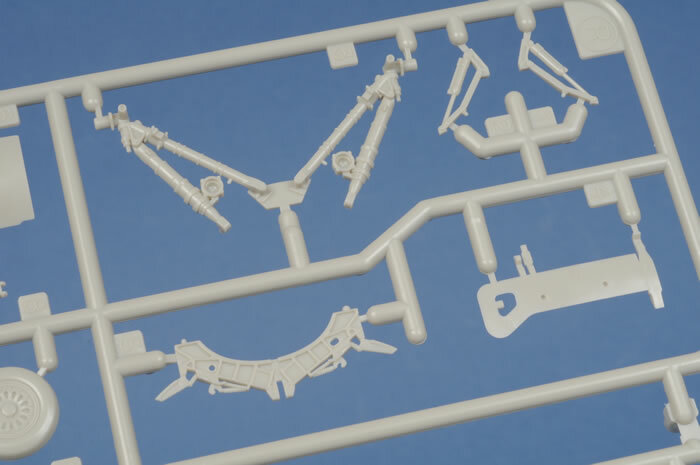 These unique parts include the small intake and F100 exhaust, early main wheels, unbulged gear doors and many new ordnance options - more on these later. The Block 50 parts are not included in this box. Surface detail is gorgeous - recessed, yet restrained, with accurate panel lines and selected rows of very subtle rivets. 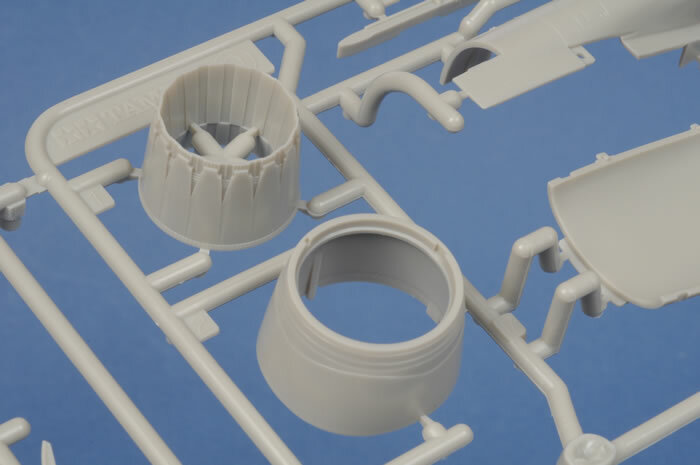 The parts are perfectly moulded with no visible flaws or ejector pins on any of the kit's facing surfaces, except a few faint pin marks (and I mean really faint) inside the wheel bay. Detail is excellent straight from the box. 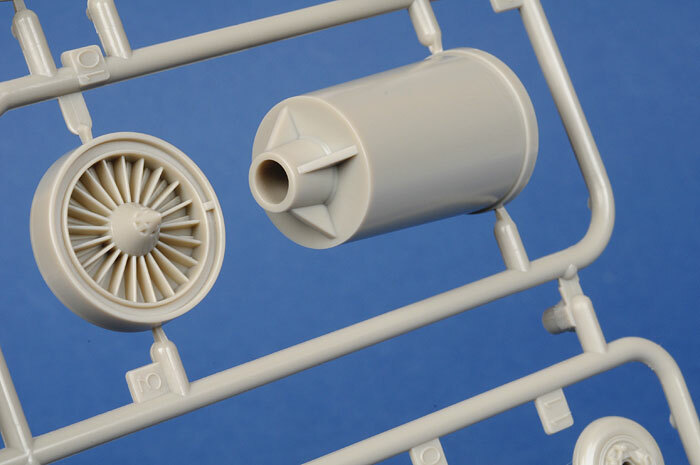 Comparisons with Hasegawa's venerable F-16s are inevitable, and the Tamiya kit is clearly superior in the high level of convincing detail provided in the wheel wells, gear doors, undercarriage legs, cockpit and the burner can. 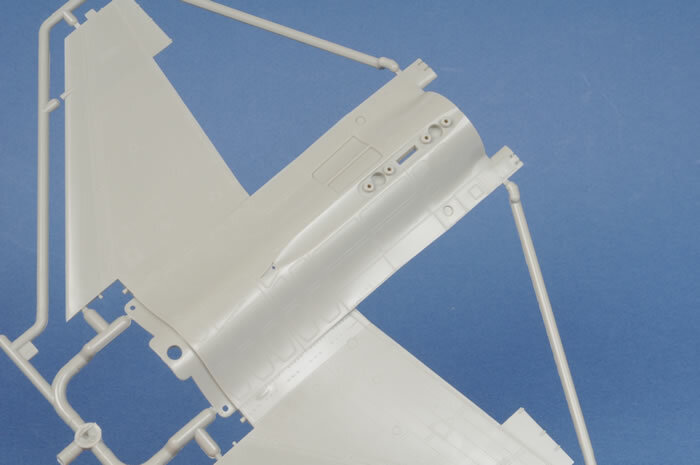 Airframe options include the "bird slicer" antenna panel in front of the canopy (this is a separate insert to permit a pre or post CCIP machine to be built), positionable flaperons (you will cut off two of four locating tabs depending on whether you want the flaps up or down), movable horizontal tailplanes (via polythene caps), and the canopy may be posed closed or open using a clever and very positive peg on the back of each side of the canopy frame. The leading edge slats are moulded up as part of the wing. Options are also offered for either tinted or clear canopy sections. Check your references carefully, as this seems to vary. 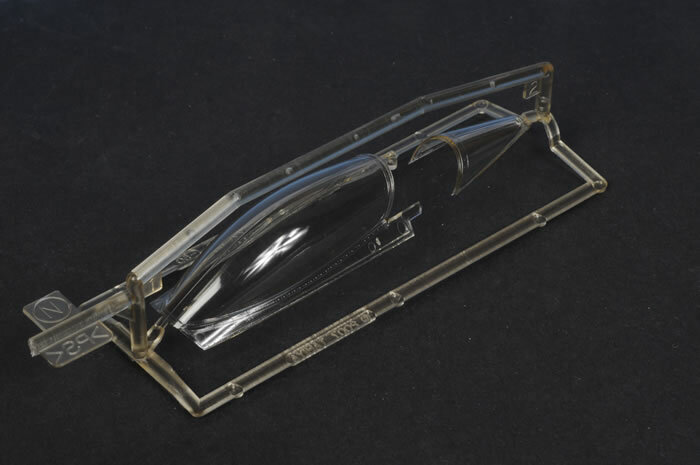 The clear parts are well moulded, thin and free of distortion, but they do have the inevitable raised seam line running down the centreline. 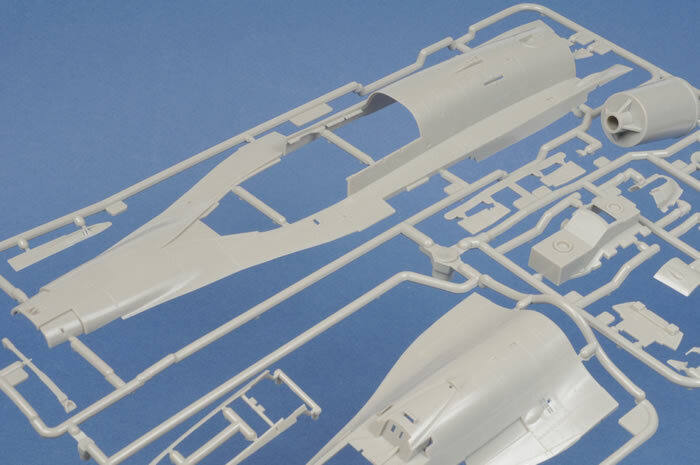 This is a result of the multi-part mould required to deliver the accurtae bulged canopy shape. Careful sanding and polishing will remove the seam line and restore the canopy's lustre. 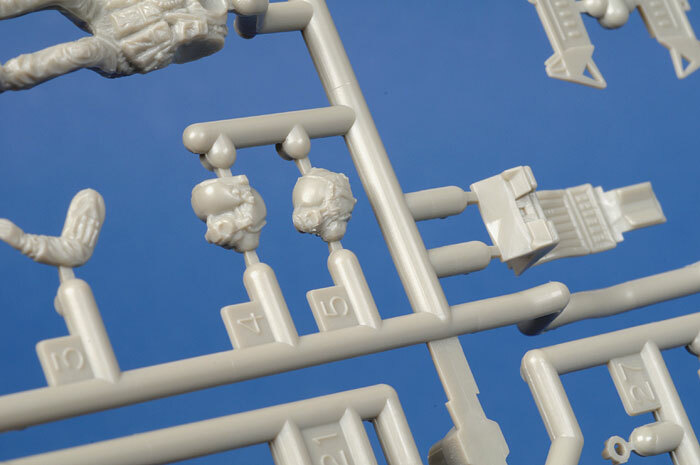 I particularly liked Tamiya's clear sprue strategy of adding an extra sprue over the top of the canopies to protect them from scuffing and damage in transit. A nice pilot figure is supplied with two heads - one with the standard helmet and the new version with the helmet mounted queuing system. This projects holographic data on the inside right of the visor. a 300 gallon centreline tank. All the weapons and their hard mounts are beautifully detailed, and benefit from full decal fitout. Being a Tamiya kit, you just know that this is going to fit well and build easily. Innovative engineering includes the use of poly caps and steel pins to fit the fin and drop tanks. 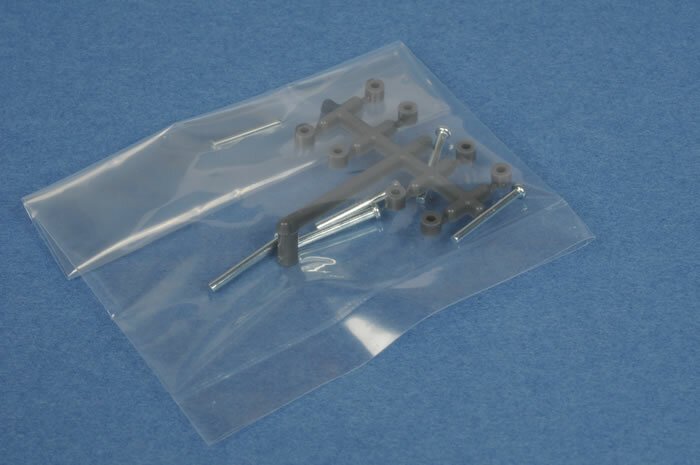 The workable horizontals stabilisers are also secured with polythene caps. 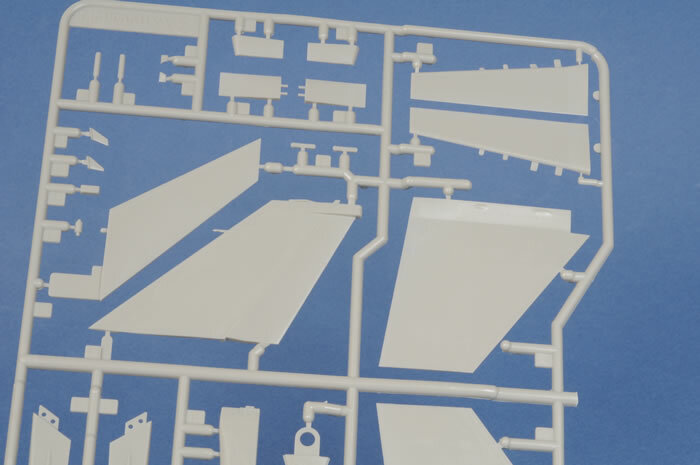 Tamiya's two 1/48 scale F-16C/CJ boxings may be mixed and matched to produce different variants. 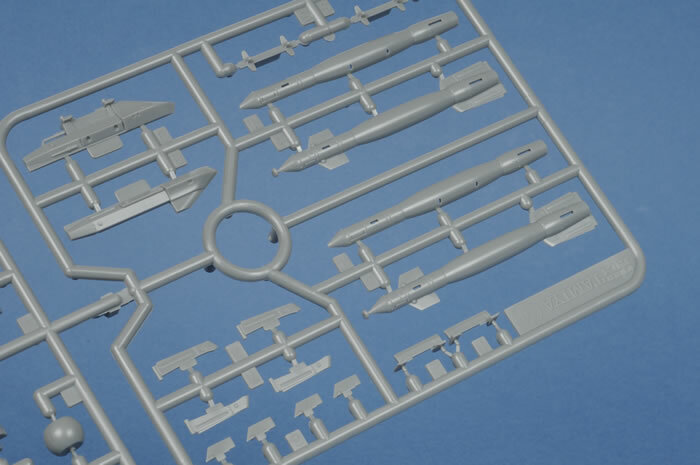 Scott Brown explains the different Block numbers and how they may be achieved using Tamiya's kit in his very useful article, "How to build various F-16 Blocks using Tamiya's kits". Five helpful diagrams accompany Scott's text. 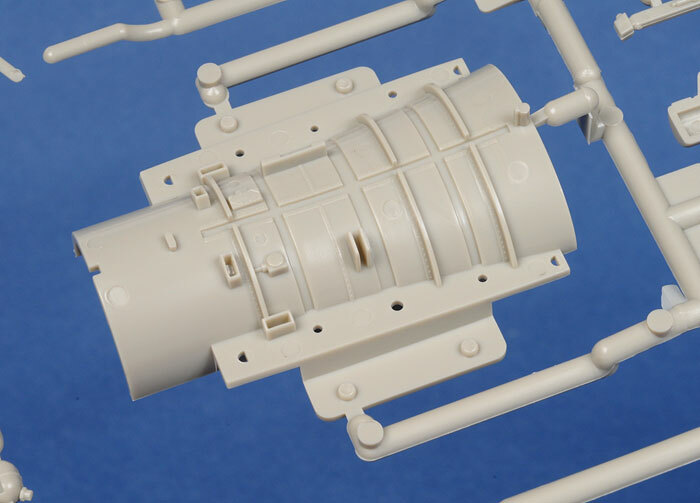 In essence though, if you swap the intakes and exhausts between the Block 25/32 and Block 50 kit, you will have a Block 30 and a Block 52 to add to your collection. See Scott's excellent article for more details. 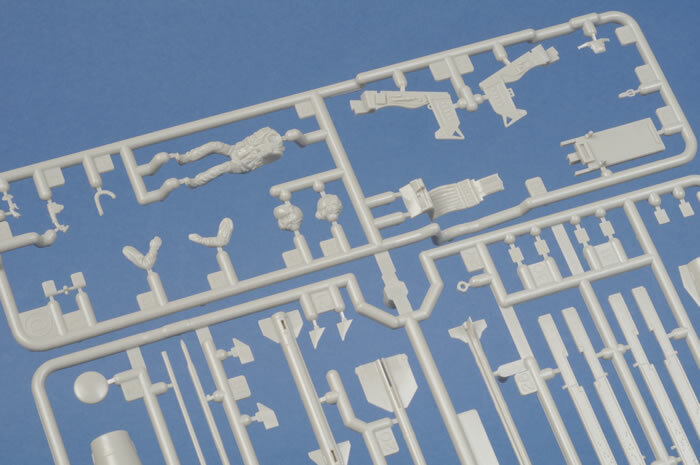 Tamiya produces a separate photo-etched upgrade set for some of the items mentioned in Scott's article as item number 12621 (also available from HobbyLink Japan). 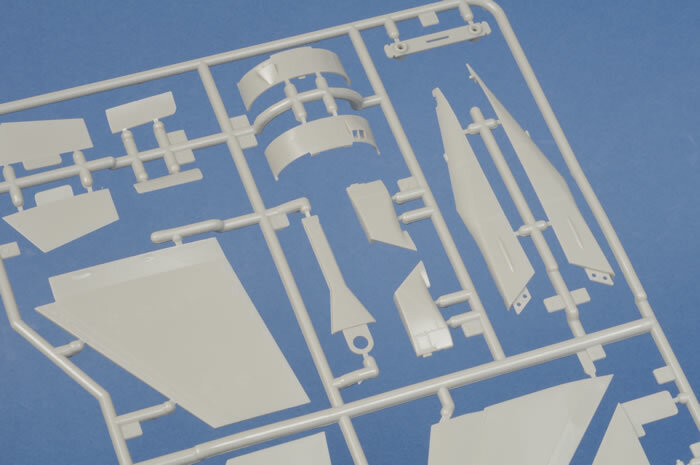 Tamiya still sets the pace in terms of finesse and ease of building, and their new 1/48 scale F-16C Block 25/32 does not disappoint. This is a beautifully detailed kit that should be a pleasure to build. The large number of ordnance options supplied are a real bonus, and will permit many real-time loadouts to be configured. 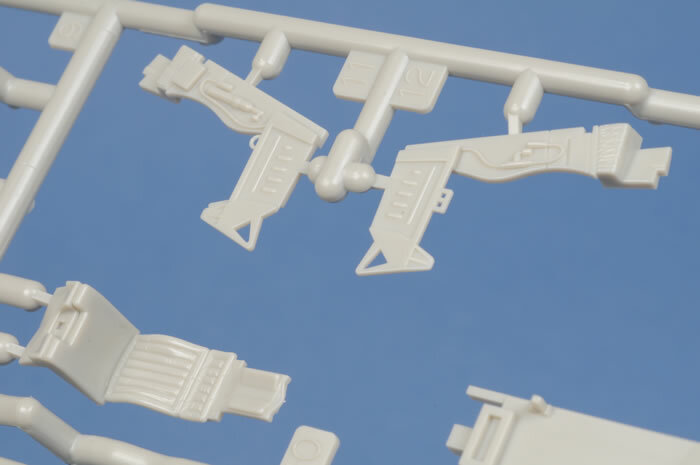 The ability to mix and match parts between the Block 50 and this new Block 25/32 kit presents the opportunity to depict even more Block versions, and we are already seeing a steady stream of after-market decal releases to cater for these simple conversions. 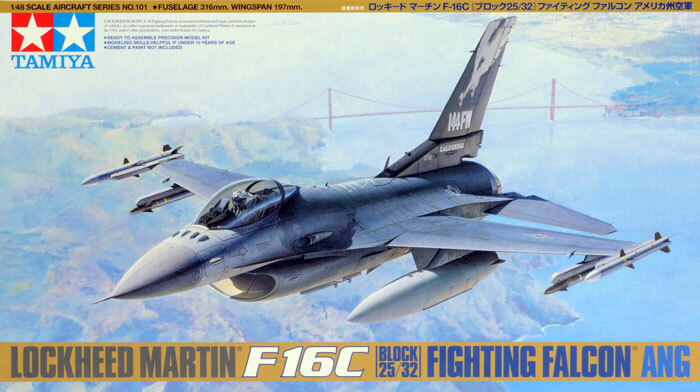 So, is Tamiya's F-16C Block 25/32 the best modern 1/48 scale jet fighter yet released? In my opinion, yes. I think it probably wins in a close contest with last year's Block 50 thanks to this new kit's generous ordnance allowance.